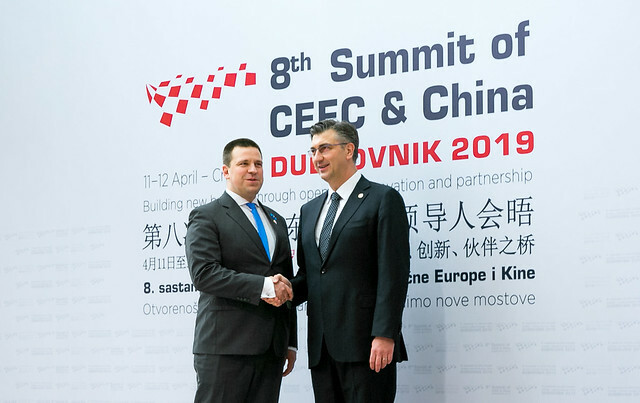 Dubrovnik, Croatia, 12 April 2019 – today, at the meeting of China and Central and Eastern European countries in Dubrovnik, Prime Minister Jüri Ratas stressed that it is important in the economic relationship between Europe and China to guarantee equal opportunities to entrepreneurs of both regions, respect their intellectual property, as well as monitor cybersecurity in the fast-developing world of digital connections and e-commerce. “The relationship between China and Europe is constantly growing closer. This provides some great opportunities for Estonian entrepreneurs. I am very glad to see Eesti Energia, Magnetic MRO, and PRFoods, among others, participate at the economic forum in Dubrovnik. It is important to both Estonia and Europe that our enterprises have better opportunities to compete on the Chinese market and that our business activities would have to face fewer unfounded restrictions,” Prime Minister Ratas said. After the summit, Ratas has scheduled a bilateral meeting with Le Keqiang, the Premier of the State Council of the People’s Republic of China, to discuss ways for Estonian entrepreneurs to expand their business on the Chinese market, as well as cooperation in the fields of tourism and culture. “Trading, cultural and educational cooperation, and tourism between Estonia and China are expanding. Because of that, we are interested in better rail connections and direct flights. We can also improve access for our food manufacturers to the Chinese market, whereas cooperation in the fields of tourism and economy could be enhanced by, for example, mutual recognition of the other country’s driver’s licence,” Ratas said. “Estonia also finds that secure digital unions in all areas of our society are very important and would help to improve economic cooperation as well as create economic success and new jobs for all parties,” Ratas noted. Tarmo Tamm, the Estonian Minister of Rural Affairs, and Ni Yuefeng, the Minister of the General Administration of Customs of China, signed a protocol that will allow enterprises to export their salmonids to China. Similar minutes have been signed for exporting sprat and Baltic herring products and chicken products. Concurrently with the summit, a business forum is taking place, where many Estonian entrepreneurs are participating. This year, the annual summit of 16 Central and Eastern European countries and China, or the so-called 16+1 summit, was organised in Dubrovnik. Participants of the meeting included 11 countries of the European Union, five countries of the Western Balkans, and China. After this year’s meeting, Greece will join the cooperation format. At the summit, Ratas also had a private meeting with Andrej Plenković, the Prime Minister of Croatia.